CLASSICAL GUITAR. CLEAR AND SILVER SET. TIE-ON. BEST SELLER. 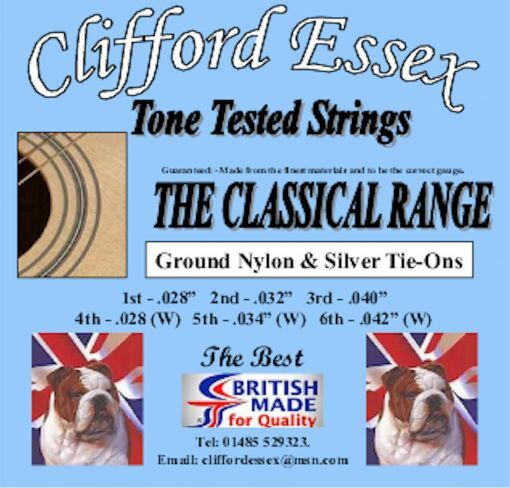 Clifford Essex classical guitar strings are tone tested and guaranteed to be of the highest quality. FLAMENCO GUITAR. TIE-ON. CRYSTAL CLEAR TONE. CLASSICAL GUITAR. BLACK AND SILVER SET. TIE-ON. CLASSICAL GUITAR. CLEAR AND SILVER SET. BALL-END.